Holy cow, it was hot today. Max and I stayed inside and watched kids movies all day and scrapped our previous library plans (would have involved leaving the air conditioned house to walk to the garage). So while he was watching Cars for the bazillionth time, I rearranged my entry hall table and put some summery items on it. The beach ball is actually a vintage rubber ball. By some freak of nature, it turns out to be the perfect size for this little adirondack chair. Other than to show you this absolutely amazing tablescape (do I take myself too seriously? ), the whole point of this post is to introduce you to a neat blog that I ran across when I was looking for a summery image to print out. I do that a lot – print out a postcard image on card stock on my own printer rather than buying an original vintage postcard. The blog that I found this image on was Vintage Travel Postcards. Brian scans some of his vintage postcard collection and posts something new practically every day. Sort of like The Graphics Fairy for vintage postcards. You can search through his “labels” area on the right hand side and see what a wide variety of postcards he has. Anything from the water skiing girls in Cypress Gardens to the Horeshoe Falls at Niagara Falls to an alligator in the Everglades. Go on over and show him some blog love and check out what he has. I checked with Brian and you are free to use the postcard images for whatever you want. They are great for vintage vignettes, projects or blog images. Of course, it would be polite to link back to him if you use any of his images on your blog. Linking with Marty at A Stroll Thru Life for her Tabletop Tuesday, Kim at Savvy Southern Style for her Wow Us Wednesday, Very Merry Vintage Style‘s Share The Love Wednesday and My Romantic Home for Show & Tell Friday. 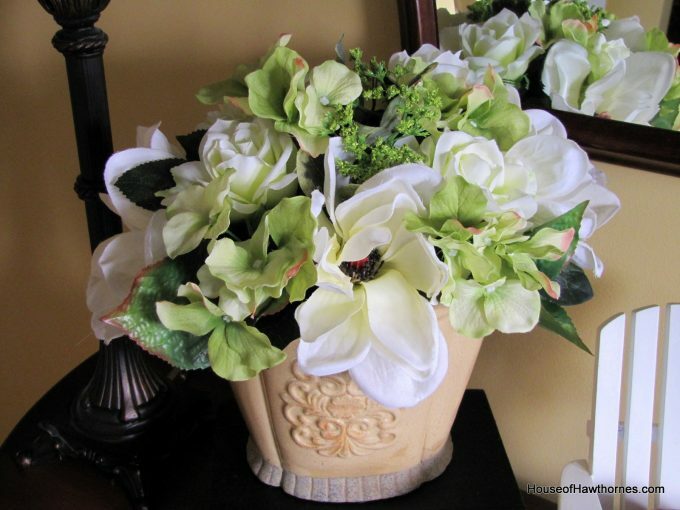 Love your vignette, Pam! 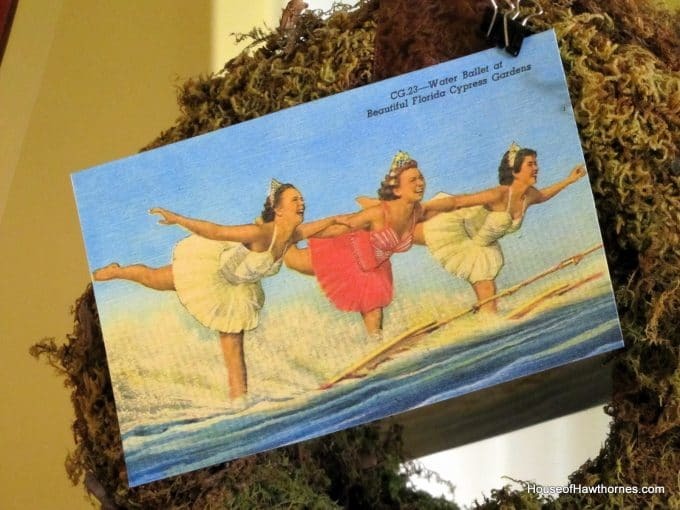 Cypress Gardens postcards are some of my favorite images! What a cute little beachy scene. I love postcards, so this is so fun to know. Thanks so much for sharing. I will definately check Brians blog out. Love your vignette! I adore that postcard pinned to the wreath. Thanks for sharing Brian’s site, I will be there next. Great vignette, Pam. Staying in the air conditioning was a very wise decision. 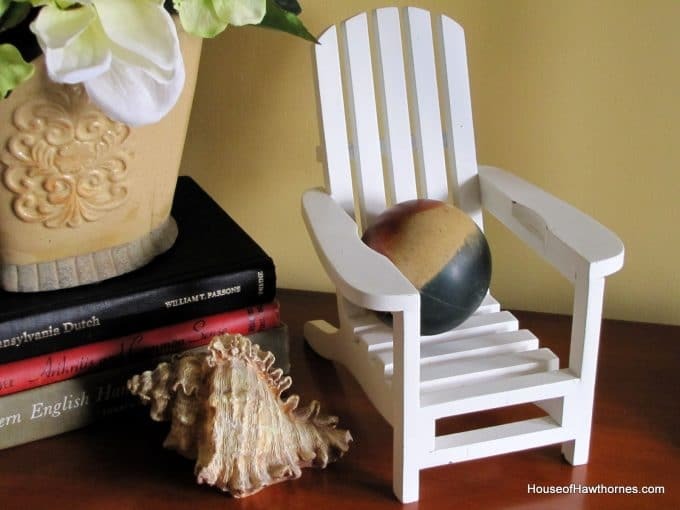 Your little beachy chair is adorable on the table! Reminds me of summers playing in the surf and sand! Love it! Those gals look like they are having fun! Yes, hot tamale today, spent most of the day inside myself painting furniture…..just too darn hot! Such a cute vignette and yes, now it is way too hot. Now the darn high humidity is here. It was really not so hot that I couldn’t take it before. Now I cannot stand out heavy the air is. Stay in and stay cool is what I say. It’s only been in the high 70’s here this summer. Back home it is hotter than snot! Don’t know which i perfer but would like it hot for a beach day!! What a lovely vignette! The little chair and beach ball are adorable! The vintage postcard is precious. I will have to go over and check out his sight! 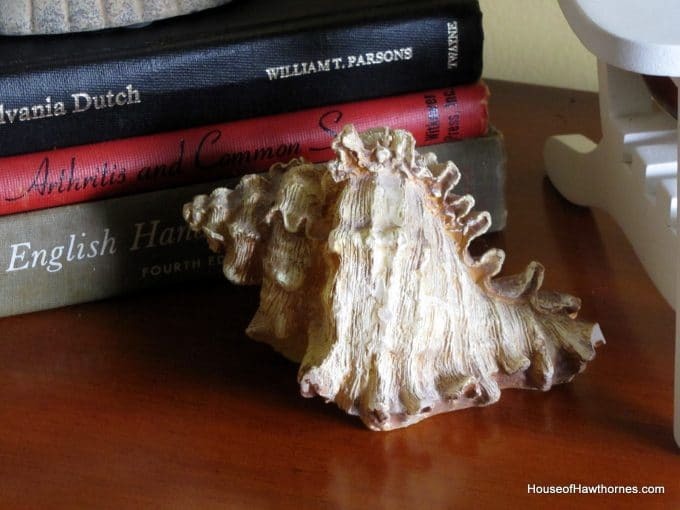 I love to tinker on vignettes on hot or rainey days….your vignette is lovely and love the summer vibe, well done!! I love that postcard image and what a great idea to do a travel vignette for summer decorating! Thanks for sharing your new source. Thanks for linking up to Share the Love Wednesday–! A/C is my favorite part of summer. My father’s name was Max and my grandson was named Maxton. 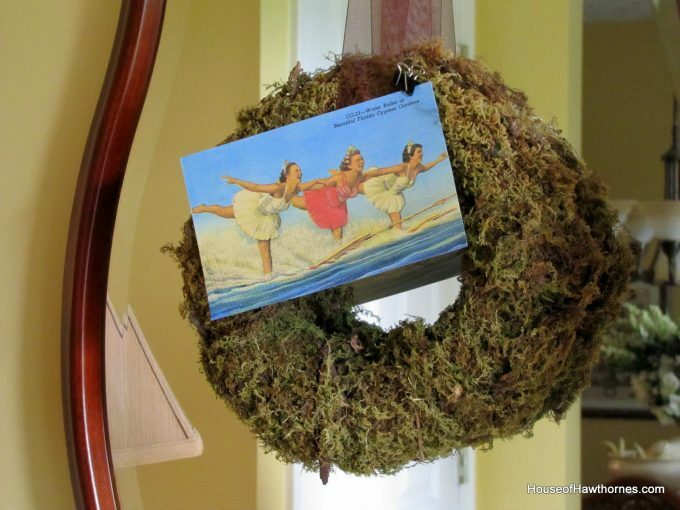 Love your vignette and thanks for sharing the vintage postcard blog! I am planning on making a travel journal for my trip to NYC, and I bet some of those vintage postcards would be great embellishments! Hi, Pam! Thanks for the tip about Vintage Travel Postcards! Sounds like a great source. Just got back from Brian’s blog. It’s gonna be good. I understand about it being to hot to go anywhere. Nice to see it didn’t kill your creativity. It has mine it seems. I know this will sound crazy, but I am soooo envious of all the blogs I’m reading that say, “it’s so hot” 🙂 I’m in the NW still waiting on summer. 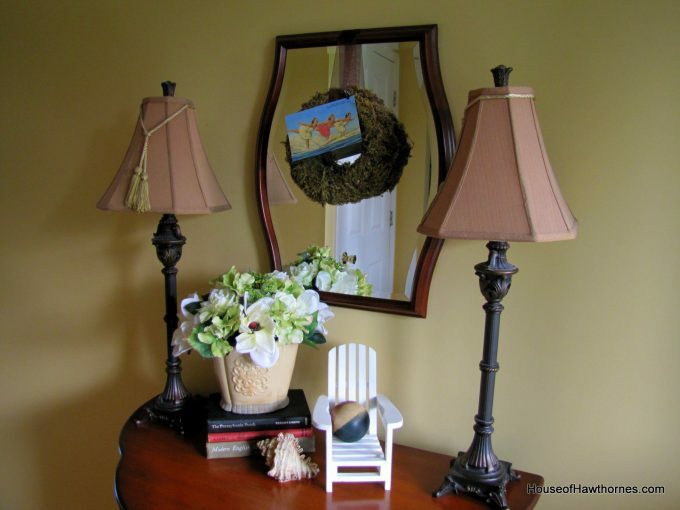 Love your summer vignette and looking forward to checking out that vintage postcard site. cute vignette, it has been wonderful here the last couple days but hot is on the way!! so I am trying to do some outdoor stuff now so I can hide inside too! But I am not watching Cars! Love the vignette. Thanks for the great link too. I look forward to meeting you on Saturday for the Buckeye get together. Your vignette is splendid. I’ve been messing around with my beachy summer items on my fireplace tonight. Many thanks for sharing the vintage travel postcard site. I cant’ wait to explore it further! I love the skiing girls postcard..Thanks for sharing the source. I’ll go check it out now!!! I LOVE this! I adore “little” chairs like this and always snap them up when I come across them! The ball is perfect! Thanks, Pam for sharing the vintage postcard source. Your travel vignette is so imaginative! Lovely vignette…and I love the sweet postcard. Thanks for sharing the source.